Extra-thick, silicone-impregnated, sheepskin cloth cleans and protects your valuable firearms so they’ll stay looking like new. Advanced silicone formula easily removes corrosive fingerprints, dirt, dust, and grime, making it ideal for wiping down your firearms before they go back in the case or on the gun rack. Leaves behind a long-lasting, protective flim for advanced moisture resistance and rust protection. Works on wood, metal, and plastic surfaces. 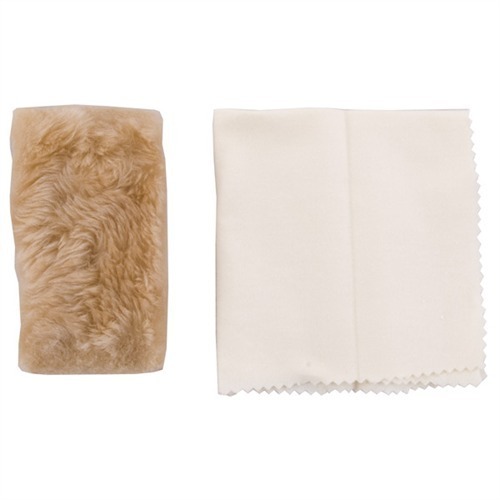 Features a 1" thick, super-soft sheepskin pad with leather backing, plus a flannel cloth to help wipe away any excess silicone. Includes instructions and plastic bag for convenient storage. Rifle Silicon Gun Cloth intended for larger firearms. This is a great product. Easy to use, shined up my guns like new. It did not leave them slippery or wet. This is a must have for shotgun and rifle owners. Glad to see that brownells found Rusty's. Great product that eases use, particularly for the rifle shooter who likes to oil down the metal parts prior to storage. This is one of those 'Why didn't I think of that' moments. Man, this kit is so easy to use. My guns look awesome now and they are very old. The sheepskin gets down in all of the cracks protecting the WHOLE gun unlike any other kit on the market. Highly Recommended! This gun cleaning rag is fantastic. It gets in to all the grooves that the traditional cloths just don't reach easily. The oil leaves behind a fantastic finish on the firearm as well. Christmas is coming and I plan to buy some more of these cleaning cloths to give as gifts to my shooting buds. This is easily the best gun cleaning cloth I have used. Gets into all the nooks and crannies very well. Comes highly recommended, as does the larger rifle version (2x the size) and replenishing oil. This is a great product for cleaning and preserving the finish on your firearms. If you haven't tried this cleaning cloth, you are certainly missing out. It lays an even coating and puts a lint free shine that just can't be reproduced with the other products that I've tried. Much better than the flannel silicoe cloth because it gets in the 'nooks & crannies' of my guns. I did not believe this product was as good as everyone was saying, but I was wrong. My gunsmith even switched over to the Rusty's Rag. Does that tell you anything? Just received my Rusty's Rags and first wiped down a 1911. I was so impressed I took everything out of my safe and treated every firearm I own. This has a magical way of transforming a blued firearms and is a great value. I never thought I would use anything else to wipe down my many guns other than my trusty old yellow silicone flannel cloth. Then came along the Brownells/Rusty's Rag gun wipe. It is so much better than the flannel because it spreads the silicone evenly on my guns and also gets in the many small nooks and crannies the flannel can not get to. My friend who got me hooked on these things said it to me this way. Cleaning and wiping down a gun is a lot like brushing your teeth. A dentist will tell you it is a lot more important to floss than brush alone. Same holds true for guns. If you don't get down in the small areas, your gun is not completly oiled and protected. The Brownells/Rusty's Rag gun wipe just makes plain sense. This has to be the best gun wipe I have ever used. And I have been using gun wipes for over 40 years. Trust this old timer and buy this product. All I have to say. - John M.
I bought one of these 6 months ago and it still works like new! I really don't know what to write because all of the other reviews about this gun wipe really say it all. It don't get any better than this. I feel I have to write something and that something is: BUY THIS RIGHT NOW. YOU WILL BE GLAD YOU DID!! I usually don't do reviews but when something this good comes around ever now and then(10-15 years or so), I feel it is my duty to let my gun buddies and other fellow gun enthusiasts know about it. It looks simple, but really works. Take it from this old fart who knows a thing or 2 about guns. I have been shooting them for over 60 years now (I'm 74, started at 14). You really won't be disappointed with this product. Really like this product. Don't forget to buy the 1 oz. bottle of silicone oil (SKU # 080-000-794). The sheepskin will dry out after about 12-15 uses on a handgun. I bought the oil and it seems like it will last for a long time. Great Value for the money. As a pawn shop owner, I need to move items FAST in order to make money. The more items I have going out, the more money I have coming in. I own several pawn shops in the Southeast. One of my customers told me about this new gun wipe that Brownells invented and told me to try it on the guns we have for sale. My stores have around 500 guns at any given time. I assigned this task to one of my employees at our main store. He throughly cleaned each gun as we normally do with our outers gun cleaning kit and then he used the Brownells Rag to wipe down the guns before putting them out for sale. He also wiped down the guns that we had already cleaned and put them back on the gun racks and in the display cases. We were all surprised by the results we began to notice. Not only were our gun sales go up at our main store, we were also getting MORE MONEY on our guns than we have in the past and at our other stores. What surprised me the most was that more people were paying the sticker prices instead of trying to talk me down (I have been in business for 23 years and had never experienced this before). We took a bunch of 'before and after' pictures and have them displayed behind our counter on the wall at our main store. We also just started the same process at our other stores and expect to have the same results. A lot of our customers who see the pictures ask us what we used to make the guns look so good and shinny. We simply tell them to look on the shelf behind them. That is where we stock our 'Brownells/Rusty's Rags Gun Wipes and also the Brownells/Rusty's Rags 1 oz. silicone gun oil for resell. The wipes are now the #1 selling product at our main store! I recommend this product highly to anyone who owns a pawn shop or gun store and wants to improve their gun sales. Try this gun wipe out see the results for yourself! This thing is tiny, about 2 1/2 x 4 1/2". Makes it impossible to apply without getting your hands siliconed. It's also NOT 1" thick, more like 3/8". Why the manufacturer would skimp on material is beyond me. Get a Rig Rag instead. This cloth is the perfect size for getting in all of the nooks & crannies of my pistols. I have a huge gun collection and I don't just use anything to keep them protected. I use this sheepskin wipe on ALL of my guns! The Brownells/Rusty's Rag gun cloth is much better than anything I have ever tried. I have used Rig for the last 30 years. Rig is too greasy and is not good for showing off my guns to other collectors. I threw all of my Rig's away after using this product. A regular gun wipe does not get in the tight areas. They got thrown in the trash also. Perfect size, perfect oil, doesn't get any better than this! Take it from someone who has been tinkering with guns for over 40 years. Buy this cloth for your gun protecting needs! This is just what I have been looking for to wipe down my guns on a regular basis. I collect guns and when I show them off to friends they leave fingerprints all over the guns. Of course all of us knows that fingerprints lead to rust. This product is perfect for wiping off fingerprints and other harmful elements. I have been using RIG, which is not only very greasy, but gets grease on your hands. This product is NOT GREASY OR SLIPPERY. It is flat our perfect! I decided to give this product a try after reading all of the positive reviews. I am glad I did. It is very easy to use and get in the hard to reach places. When I got this product in the mail, I wanted to use it on an old S&W .38 I had. It was in very bad shape. I had just purchased it from a local pawn shop. Boy, I could not believe the shine this product put on that .38. If it did not have any scratches and dings on it, you would swear it was a new gun. I was so impressed that I used it on all of my guns in my safe. Very impressed with the results. I likey and you will likey too! This is just what I needed to wipe down my guns after shooting and showing them to my friends. I recommend this product to anyone who owns a gun. Protects against rust, leaves a bright shine. Easy to use also. Not slippery or wet like other gun wipes. Got to have!! This is what I have been looking for to wipe down my guns. High Quality and will last a long time. Don't forget to get their oil also! This is the best thing i have ever used for wipedown of firearms. The wool really gets into tight spots. ive had one over 2 years and it still looks like new. I was sent this from the inventor of Rusty's rags. He sent a bunch for me to hand out to my unit while I was in Afghanistan. The wool on this got into all the little cracks and got the dirt. Made the gun look like it was stateside, not in theater. Been looking for something like this for a long time. Thanks Brownells for carrying this great product. I like this set well enough that I give them away as Christmas presents. Great product!!! Finally. I just wipe down my guns (& knives) with the sheepskin applicator and wipe off with the flannel cloth. How easy is that? I love my Rusty's Rags! I use these for all my guns, knives and also a few swords I own. You must own a Rusty's Rag if you have any of the above! Perfect in every way. A fellow gun shooter was wiping down his guns at the range and let me try it. It will be in my bag from now own. Bravo! This is a must have for range shooting. Simple to use and very effective. Highly recommended! Pistol Silicone Cleaning Cloth 050806109780 Extra-thick, silicone-impregnated, sheepskin cloth cleans and protects your valuable firearms so they’ll stay looking like new. Advanced silicone formula easily removes corrosive fingerprints, dirt, dust, and grime, making it ideal for wiping down your firearms before they go back in the case or on the gun rack. Leaves behind a long-lasting, protective flim for advanced moisture resistance and rust protection. Works on wood, metal, and plastic surfaces. Features a 1" thick, super-soft sheepskin pad with leather backing, plus a flannel cloth to help wipe away any excess silicone. Includes instructions and plastic bag for convenient storage. Rifle Silicon Gun Cloth intended for larger firearms. Rifle Silicon Cleaning Cloth 050806110199 Extra-thick, silicone-impregnated, sheepskin cloth cleans and protects your valuable firearms so they’ll stay looking like new. Advanced silicone formula easily removes corrosive fingerprints, dirt, dust, and grime, making it ideal for wiping down your firearms before they go back in the case or on the gun rack. Leaves behind a long-lasting, protective flim for advanced moisture resistance and rust protection. Works on wood, metal, and plastic surfaces. Features a 1" thick, super-soft sheepskin pad with leather backing, plus a flannel cloth to help wipe away any excess silicone. Includes instructions and plastic bag for convenient storage. Rifle Silicon Gun Cloth intended for larger firearms.